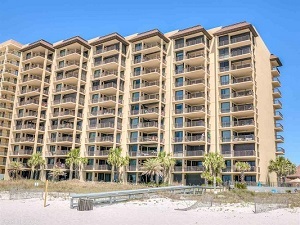 Romar House gulf-front condo for sale in Orange Beach Alabama. Gorgeous 3BR/2BA gulf-front resort property in a gated community This unique residence has updated cabinets in the kitchen and in the bathrooms – also features solid-surface counter-tops. The beachfront condominium has exceptional views of the Gulf of Mexico and the popular white-sand beaches from the living room, master BR, and private balcony. Ideal second home – covered parking and storage slip are also included Community amenities include – outdoor pool, conference room, exercise facility, tennis courts and more…come see this resort property today!